From being high on Nyaope (a street drug in South Africa) to being high on life – the 34-year old amputee, Xolani Luvuno, has captured the hearts of the nation. His determination, courage and willpower shows South Africa how achieving the impossible, is possible with the right amount of perseverance. Life has undoubtedly been challenging for this athlete. During Xolani’s teenage years, he dropped out of school in Port Elizabeth and turned to a life of crime, which led to some jail time. In 2009, Xolani found himself begging for money, dependent on Nyaope and alcohol, and living underneath a bridge in Pretoria after having his leg amputated as a result of bone cancer. In 2016, his life changed when a man he now refers to as “his father, his coach and his everything”, Hein Venter presented him with a job at his perfume factory. This is where he got fitted for a prosthetic leg and stopped taking drugs – cold turkey. However, he continued with alcohol abuse, but after some tough love from Hein, he stopped drinking. As soon as he realised that he desperately needed to live a better life, he replaced his substance addictions with a new addiction: running. With his new-found passion, he joined the Sunbird Striders running club. He started with a tough 5km run and went on to complete his first marathon in seven hours, using crutches. 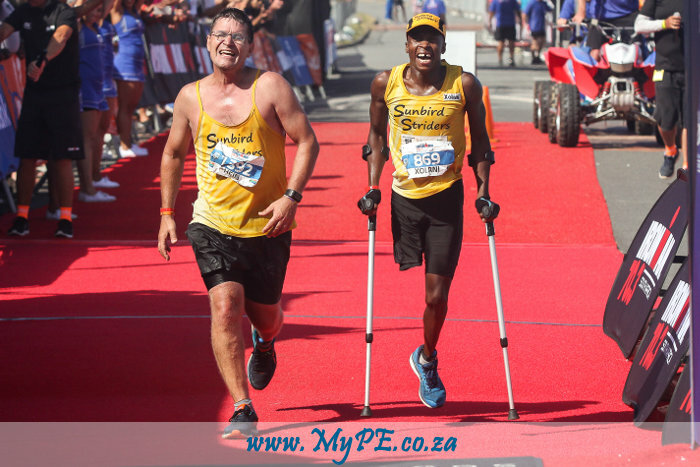 After a lot of hard work and pain, he was hooked on running and had made it his mission to complete the Comrades marathon. Two years later, Hein and Xolani stood at the start line of the Comrades five hours prior to the big race. The organisers had allowed them a head start, due to Xolani having a disadvantage over the other athletes. “I do realise that my story can be a source of inspiration to others. It is important for me to keep on doing things that will inspire people so that they will also challenge themselves and will experience some of the joy that I have experienced since I got involved in sport. We must just all challenge ourselves to do new and difficult things. It does not just have to be sport. There are many other areas in our lives where we can have wonderful experiences if we choose to do that which seems difficult. Nobody ever achieves real success if they are not prepared to be brave and face challenges” Says Xolani. This courageous athlete will stop at nothing to prove that anything is possible. It is thrilling to hear that Xolani is aspiring to achieve even greater heights by taking part in the 2019 Standard Bank IRONMAN African Championship event on the 7th of April in Nelson Mandela Bay. There is no doubt that the Friendly City will be rooting for Xolani and his father figure. Next: On Your Marks, Set, Go!